Since early this year, my 12-year-old daughter has been cleaning the house for us. It has been a nice little win-win: I have one less thing on my own to-do list and she has a little extra spending money. There was just one problem. I felt like I was constantly “reminding” her to do various cleaning tasks. Each week I found myself saying Have you scrubbed the toilet yet? Don’t forget to empty the trash cans! I could tell from the look on her face that she was as tired of hearing these little reminders! The cleaning checklist wasn’t a new idea. When Kailea first started cleaning for us, she had a checklist to follow. But somewhere along the way she stopped using the checklist and I kicked into gear. Maybe something similar has happened to you before. You create a slick, new organizing system, and use it faithfully for a period of time. But then, something changes. Maybe your routine changes (your kids head back to school or your schedule changes at work) and suddenly you stop using your organizing system completely or at all. Creating a simple checklist to help you remember to use the system and / or how to use it could be the solution. Checklists can solve lots of problems, but the biggest advantage to using checklists is that you think of things once, and then the checklist acts as a reminder for you. What checklists do you currently use that simplify your life? Or, what area of your life could benefit from a simple checklist? Please share your thoughts in the comments section below. Check out the free checklists on our site for a bunch of ready-made checklists you can start using right away. I am a great believer and lover of checklists! I spend hours thinking, designing and creating the perfect checklists, then that “something” happens and everyone stops “seeing” the checklist and I kick in to gear as Abby so perfectly described it! I have even had the kids make their own checklists, turned the door the kids have to go in and out of everyday into a giant erase board-but it never seems to fail-a few weeks into our routine and the kids stop seeing the lists! Help! One of the best ways to make a new habit stick is to link it with something you already do habitually. (I learned this tip from Janine Adams who teaches for us here at simplify 101.) So, I wonder if there’s something you do routinely that you could link with checking the check list. Or, I wonder if could put the checklist closer to the activities that are happening on the checklist. So a bedtime checklist could go on the mirror, or inside the cabinet door that houses the toothbrush. 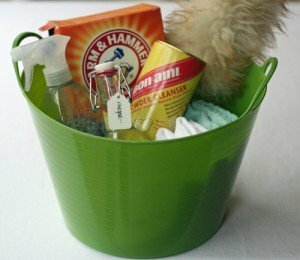 A cleaning checklist could go in the cleaning supplies bucket. So it sounds like you can take a sheet and slide it into a “sheet protector” to make it possible to use dry erase markers? Could you tell me more about where or how we can buy sheet protectors, and where it’s easy to hang these lists up for kids to see? You can buy sheet protectors at any office supply store. I use the same kind of sheet protector that is used with three-ring binders. As for where to put it…I pull our cleaning checklist out on cleaning day and put it on the kitchen counter. You can see my reply above for some other ideas. I use an app on my iPad mini/iPhone to remind me of things I need to do and when. I only need to thin of it once, add it to the list with the deadline of when it needs to be done or when I want to do it, and that’s it. I don’t need to think about it again as I will be reminded every time I look at my list. Me again. I do have packing lists for both our annual summer holiday and when we go camping. These have everything we may possibly need and are divided into sections for each person, and then general. For camping, we have a general section, the kitchen stuff, then foods.tuffs to take and then for each person. I love these as I don’t have to think. I can go and get the things from wherever they are kept and tick them off as I have them. I also add to it after each trip if there is something we should have taken so we do have it for next time. Both lists are in Excel. You’ve hit the nail on the head – I love that checklists make it so you don’t have to think! They’re especially great for high-stress times, like packing, when you might otherwise be worried about forgetting important items! Really like the checklists! Thanks! I am constantly trying to stay organized. Every tool helps! Lists serve two purposes for me… 1) It’s how I discipline myself. 2) When I have a lot of things I need to do/remember… it helps me to keep from forgetting stuff. Thank you so much for this post – it has been of great encouragement to me! I have given my almost 14 year old daughter some simple cleaning tasks to do each day and other people have been questioning me as to whether or not this is age appropriate I have stood by what I believe – children do not automatically absorb and suddenly become capable of being an adult once they become 18 or whatever – we must teach and train them now! I too use a list for her to check off and follow. I am glad to see that I am in good company in setting tasks for my own daughter! One of my goals is that before my kids leave home they know how to take care of themselves and perform basic life skills – like cleaning, doing the laundry, cooking, etc. I also believe that a family is a team, we work together to get things done. I find the age thing interesting because when my kids were very young they naturally wanted to help with everything – cleaning, taking out the trash, pushing the cart at the grocery store, etc. The older they get, the less naturally interested they are in learning and doing these household skills. But certainly my kids are capable of cleaning and doing lots of other things for that matter. They are also very interested in earning money, which I feel is also an important life skill. Learning to work in exchange for money is how life works. So for our family it is a win all the way around. My daughter will be 13 in December which means in three years she’ll be able employed by someone else. I think that by working for us now, we’re setting her up for success in getting a job and doing well at it when she turns 16. The timing of when it is right for a child to do work around the house is a personal decision for each family to make. My hope is that we can all make the decisions about what is right for our family without judgement from others. Good for you for standing by what you believe. Thanks for this topic! I love the comments about how others use lists. I live by lists, which I’ve found work best for me if they’re organized by timing or urgency. I use my Today list constantly, add nearby tasks to Soon, and ones I want to consider a little further to Someday. I use an app called SpringPad for all my lists so I can access them from my phone or my desktop. Thanks again Aby! Once this sheet is ready (just a few tweaks left), I will make to-do cards for a magnetic board for him, so that my son can “bingo” his way through his chores. My goal is for both of us to be clear on what his jobs are, the deadline for doing them, and the rewards/consequences. When my son hits a roadblock, he tends to “shut down.” I hope that his knowing what needs to be done, and seeing that individual tasks don’t take very long, will result in more confidence and less procrastination. Somebody tell me I’m not dreaming! Ooh, this is a great idea! Love that you’re including the instructions for doing tasks…I sometimes take for granted that my kids know how to do stuff that I haven’t really taught them how to do yet (or I did and they forgot.) It’s really frustrating for both of us to explain how to do something after the task has been done in a different way. This is a great idea! Can I ask how much you pay her? Did you determine the price or agree on something? Processing how we could make this transition over time in our home. What we did was come up with an hourly rate that made sense and then estimated how long it should take to clean the house. This way, if she drags her feet or takes lots of breaks, it doesn’t cost me more.